With most teams having just 10-12 regular season games remaining, we can draw some conclusions about who’s likely to make the NCAA tournament. 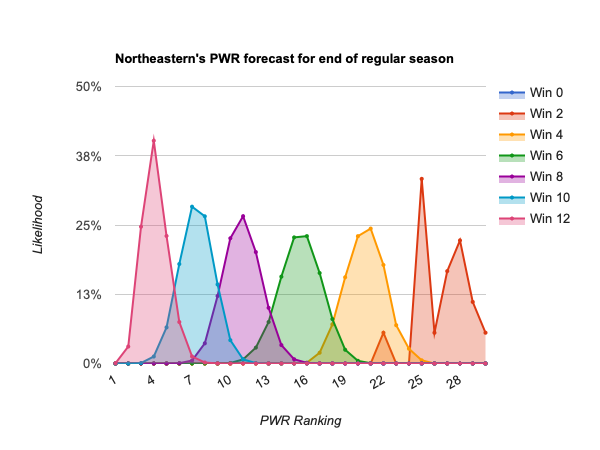 In this article, I’ll look at the regular season forecasts (see First 2019 PWR forecast available for an explanation, if you’re not familiar) to discuss how teams need to perform in their remaining games to earn an NCAA tournament berth. 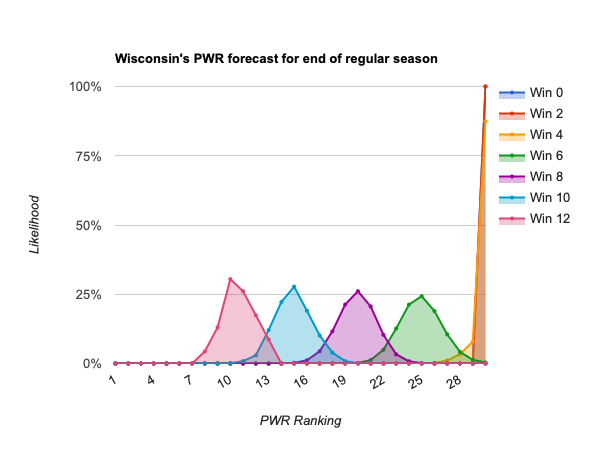 You can also always browse the weekly forecast yourself at PWR by wins forecast. No one is mathematically a lock at this point, but in 1,000,000 simulations of the rest of the regular season, there wasn’t a single one in which #1 St. 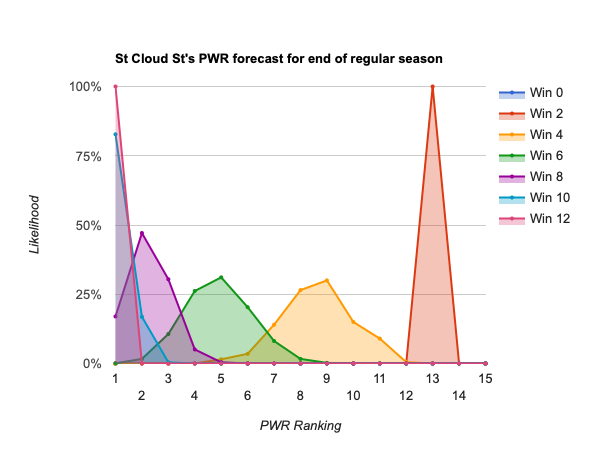 Cloud St won fewer than 2 games or dropped below #13 PWR. Of course, those simulations include assumptions about the Huskies’ strength based on their performance so far, so it’s possible that an unprecedented collapse could result in a tournament miss. But, based on their performance to date, I’ll say St. Cloud St is the one team positioned to be assured a tournament berth. Who’s in barring a collapse? 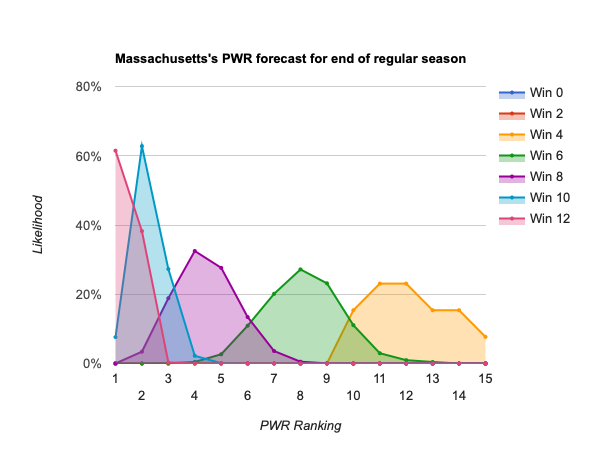 Even #2 Massachusetts doesn’t have quite as guaranteed a path. Winning just 4 games could result in a regular season PWR in the 10-15 range, which is right on the bubble of making an at-large NCAA tournament berth. Who controls their own destiny? From #8 Minnesota State down to #30 Wisconsin control their own destiny. That is, they can each end up on the bubble, or better, with a sufficiently good performance over the rest of the regular season. The lower the current ranking, the better a performance is required. For example, Wisconsin would really need to win out 11 or 12 of its remaining 12 games for the Badgers to be well positioned for an at-large berth. Who won’t make the tournament at large? From #31 Bemidji St down, there aren’t many possibilities of climbing to the bubble. A few seem to have the possibility of climbing to the bottom of the bubble, the 13-15 range, if they win out; but, even such a performance would still be pretty unlikely to result in an at-large tournament berth with a loss in the conference tournament. If you wanted to make a super long shot bet on one of these, #31 Bemidji St, #32 Dartmouth, #33 RIT, #34 Maine, #39 Boston College, and #41 Nebraska-Omaha stand the best chance. 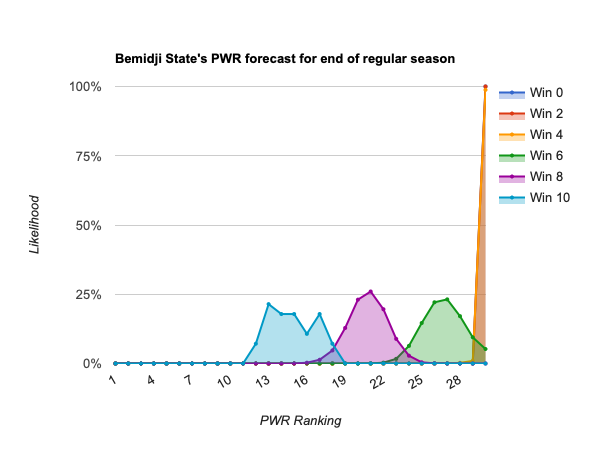 This entry was posted in forecasts on January 23, 2019 by jim.